As the Thanksgiving holiday approaches I’ve been having fun experimenting in the kitchen with different side dish options. Right now I’m digging this maple and cayenne roasted acorn squash concoction. Sweet, spicy and perfectly caramelized, this side dish is what my taste buds have been craving all season long! Ironically, acorn squash is not my favorite winter squash variety. I find it needs more doctoring up than other winter squash varieties because it’s starchier and typically less sweet. However, with the right flavor combinations the acorn squash can totally blow your taste buds away. Sweet maple syrup, spicy cayenne, fresh parsley and brown butter hazelnuts do the trick. This simple side dish deserves a spot on your Thanksgiving table and I hope you all love this recipe as much as we do. It’s hearty enough to be a complete meal if you toss in a grain like rice or quinoa but I’m loving the simplicity of this just as a side dish. Also, brown butter hazelnuts are pretty darn lovely and would be great garnished on pasta dishes, soups, sprinkled on your salad, or simply eaten by the handful. Happy cooking and cheers from Tumbleweed Farm! In a large bowl toss the squash wedges with the maple syrup, oil, cayenne and pinch of salt until evenly coated. Place the squash in a single layer on a rimmed baking sheet and bake in the oven until tender and caramelized, about 35-45 minutes. Flip the squash halfway through cooking. While the squash roasts prepare your brown butter hazelnuts. Heat a small dry skillet over medium heat. Add the hazelnuts and cook, shaking the pan often, until they are lightly browned and fragrant, about 5 minutes. Add the butter and cook, stirring frequently until the butter is golden brown and flecked with brown bits, about 5 minutes. Pour the hazelnut mixture into a bowl and set aside. 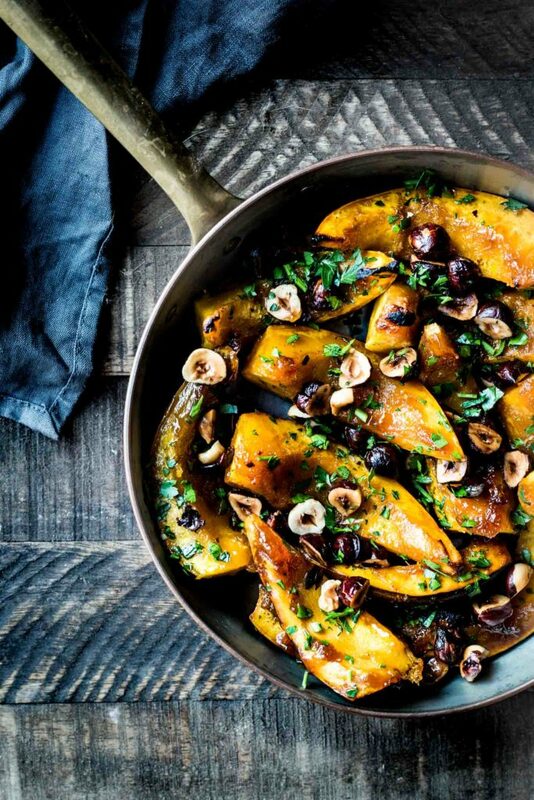 Sprinkle the roasted squash with the brown butter hazelnuts and minced parsley and serve warm.